ATLANTA, Georgia (June 15, 2014) – The National Volleyball League (NVL) hosted the 2014 Atlanta Championships this weekend with Canadians Sam Schachter & Olympian Josh Binstock and Pri Piantadosi-Lima (BR) & Karolina Sowala (PL) taking home repeat men’s and women’s titles, respectively. Both teams were crowned winners at the NVL Dallas Championships in May. Top seed Binstock and Schachter defeated seven-seed Travis Schoonover & Andrew Russell 21-18, 20-22, 15-11. Two-seed Piantadosi-Lima and Sowala defeated three-seed Erin Gray and Heather Lowe 21-14, 21-17. All of the Atlanta matches are available to view free on-demand on the NVL Network.The Atlanta tournament was held from June 12-14 and featured many of the top pro beach volleyball players from around the world, competing for a $25,000 prize purse. 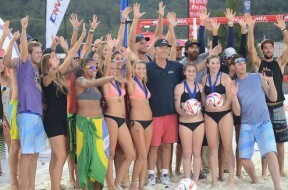 The weekend concluded with the NVL’s “Saturday Night Lights” format, which included evening finals and a beach party. Music artist Kelley James, the official voice of the NVL, performed for fans and players.